Area wrestlers competed in the District Competition Saturday in Adel for the opportunity to advance to the State Tournament, and Perry and Adel-DeSoto-Minburn will be sending three each to Wells Fargo Arena this week. This is the second straight year that both Perry and ADM will each have a trio of wrestlers competing at State, and for the Tigers it will be three familiar faces. Andrew Flora, the defending Class 2A State Champion at 126 pounds will defend his title at the tournament. ADM is also once again sending Nolan Harsh to compete at 182 pounds, and Kaden Sutton at 220 pounds. Perry meanwhile, will once again be represented by Kaleb Olejniczak, who was runner up at 138 pounds in class 3A last year, and this year he’ll get a chance to take the title in class 2A. Also representing Perry are Cole Nelson at 106 pounds and Jacob Nelson at 132 pounds. In order to advance to State, the wrestlers had to place in the top two at District in their weight class. Neither school had their team qualify for the Dual Tournament. The State Wrestling Tournament will be held this Thursday through Saturday. 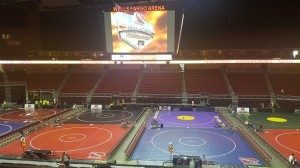 Be sure to listen to Raccoon Valley Radio during the tournament, as we will broadcast live from Wells Fargo Arena, bringing each match for the wrestlers in our listening area.